What’s not to love about this space saving luxury log cabin? Created with Baltic sourced pine, you get to choose the thickness of the timber, as well as the type of glazing you would prefer. There are two large windows which open out to allow ventilation into the building. This is great in summer months. 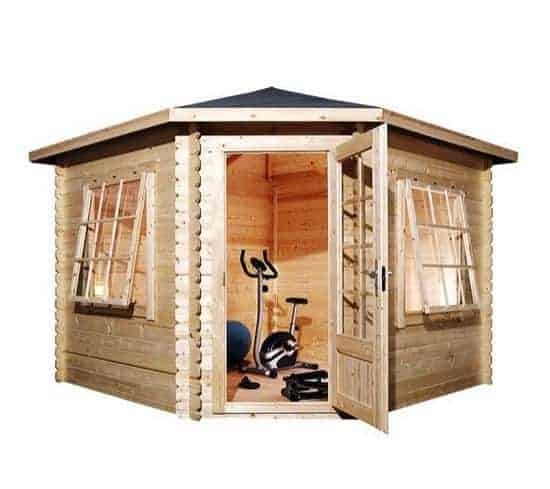 It can be used for a wide range of purposes including a home gym, sitting area or even a home office. The big single door also comes with glazing so there is always a generous amount of natural lighting in the building. 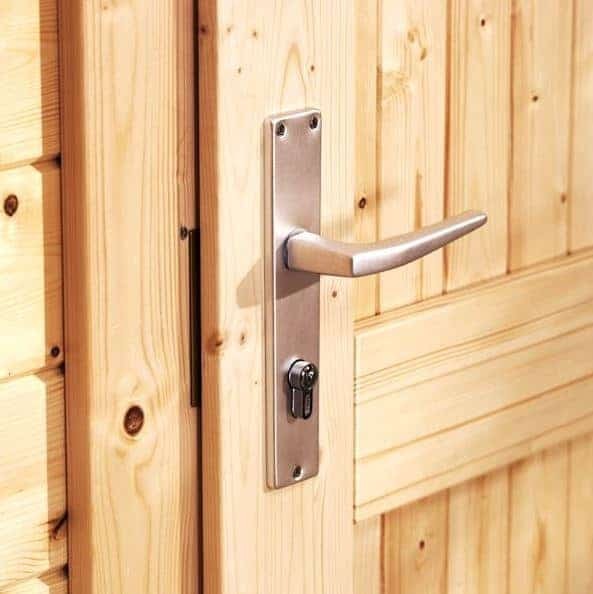 What’s also great is that the door comes with a secure Mortice lock which ensures maximum security. Floor bearers are included to lift the cabin off the ground, eliminating damp problems and also giving the building extra support. The roof is also fully supported with thick 44mm roof joists. 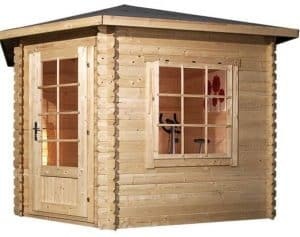 Overall you are left with a very stable, strong and durable cabin. 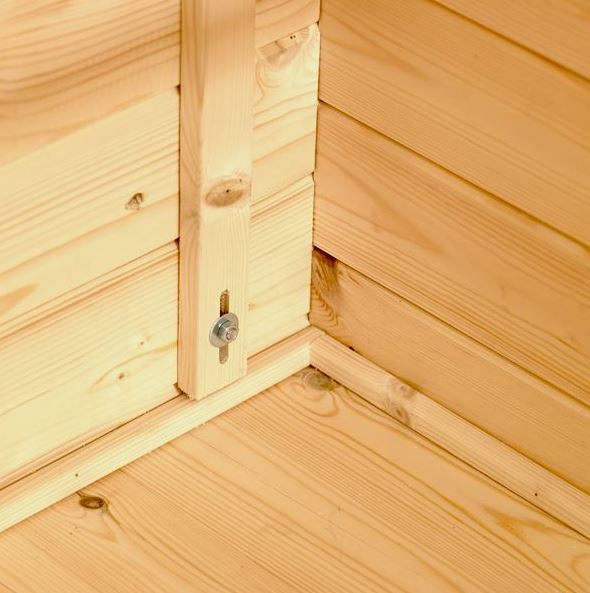 Corner joints Chalet connections have been added to not only boost strength and rigidity, but also to add a nice aesthetic design. 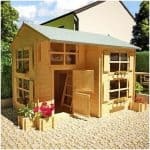 This truly is a beautiful building that will look fantastic in any garden. Its compact, hexagonal shape makes it easy to install in corners of the garden, making it an excellent choice for those who have limited space opportunities. Unpainted design won’t be to everyone’s taste. Though you can paint it or use a coloured treatment to remedy this. This is a premium quality, good sized corner log cabin which can be used for a wide range of purposes. With an unusual style apex roof, this hexagon shaped building benefits from great year round weather protection. Most apex roofs are designed to direct the water away from the building in two directions; typically down either side of the building. However, the roof on this cabin follows the unique hexagonal shape, directing the water away from the building from every possible angle. This increases its weatherproof capabilities and guarantees excellent protection against rot. Of course, the additional benefit of this roof is the fact it increases the height of the interior; not just centrally, but throughout the entire circumference of the building. Another notable feature of the roof is the fact it is created with 19mm tongue and groove cladding. It is also covered with heavy duty sand felt. So its durability is fantastic. So just how tall is the roof? Well the eaves measure 2.12m, while the roof measures an impressive 2.80m. This makes it one of the tallest log cabins available on the market. The large door measures 0.92m wide and 1.95m tall, while the depth and the width of the cabin both measure 3m. All log cabins tend to have a very thick design and this one is definitely no exception. However, what does make this building stand out is the fact you have a choice of two different thicknesses. Firstly you have the standard 28mm thick tongue and groove cladding which comes free as standard. Or you can choose to upgrade to either 34mm or an incredible 44mm thick cladding. Obviously the thicker the cladding, the more expensive it will be. However, if you do have the budget to upgrade it is definitely worth doing due to the exceptional durability and security it provides. The tongue and groove interlocking design helps to really boost durability. 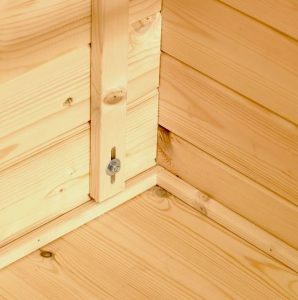 The timber literally locks together to form a strong water-resistant barrier. Even if you stick with the 28mm cladding, it still provides great insulation in the winter months and also provides a protection against high winds. 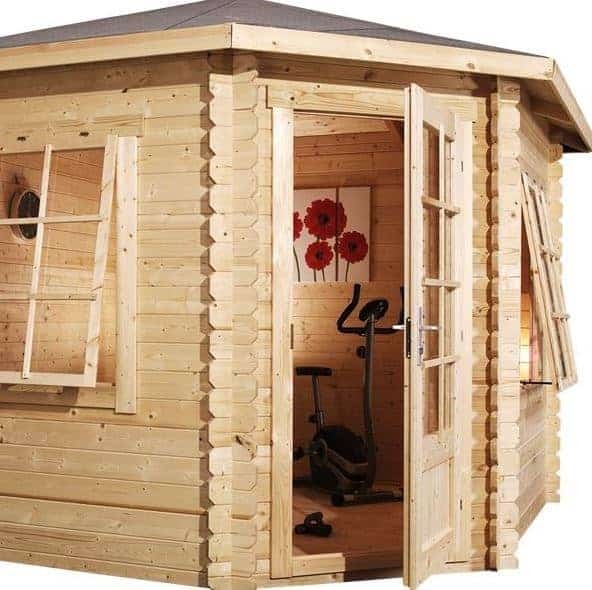 Whatever the UK weather throws at it, this cabin is perfectly capable of withstanding any potential damage. The actual timber itself is Baltic sourced pine. 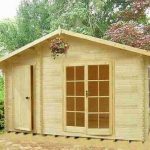 This is a very high quality type of timber which is not only durable, but very attractive too. As you’d expect, the framing of the cabin is also thick and sturdy to accommodate the weight of the cladding. What’s really great about this cabin’s design is the fact that the floor is constructed with 19mm thick tongue and groove cladding. 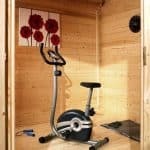 This means you can store gym equipment and heavy, bulky furniture without worrying about damaging the floor. It adds to the cabins overall strength and highlights its exceptional quality design. Whilst the cabin is created with incredible weather-resistance in mind, it does require annual treatments. Once constructed you will need to apply a very high quality preservative to ensure you benefit from the included 10 year anti-rot warranty. Spirit based treatments are recommended as they work into the timber and form an inside-out barrier against rainwater. They are also fade resistant. It isn’t just important to treat the cabin after construction in order to benefit from the 10 year warranty. You will also need to maintain the treatments in accordance with manufacturer’s instructions. Each type of treatment is different so you will need to follow the directions given on the treatment you opt for. Due to its space-saving design, the cabin features one wide single door. However, don’t worry – there’s still plenty of room given to move even large furniture in and out of the building with ease. It also comes with the added benefit of a glazed design. This means natural light filters through into the building, helping to give a bright and spacious feel to the interior. It also has two large glazed windows which you can open to allow air to filter in, providing brilliant ventilation. You have a choice of single or double glazing which will feature on both the door and windows. The single glazing measures 4mm thick, whilst the double glazing option measures 16mm thick. The double glazed option helps to provide better insulation, helping to keep the cabin warmer and more comfortable in the winter months. It’s worth noting that single glazing comes as standard and is included in the cost. Double glazing on the other hand will come at an extra charge. At first glance, you would think the windows on the cabin would compromise its security. However, Waltons have added some high quality security features for great peace of mind. The mortice lock is the most notable feature. You’ll notice the cabin has a handle just like the ones found on houses. This makes it exceptionally easy to open, whilst also incorporating a mortice lock. Basically this type of lock has a recessed design that is built into the actual door. 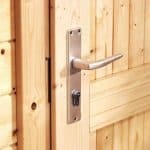 The majority of locks found on outdoor buildings tend to be installed onto the door’s surface. This built in design helps to provide a much more secure locking system that is difficult for thieves to get into without the key. The windows are also pretty thick and won’t be easy to break; even if you stick with the single glazed option. However, the double glazing will add extra protection and prove even more difficult to break so that’s another reason to consider upgrading. If you’re worried about privacy, you could put blinds or curtains up to cover the door and windows. As the cladding is exceptionally thick, it can easily support curtain poles. Despite already packing some pretty awe-inspiring features, you also have an excellent range of customisation options and extra to choose from. Let’s talk about the customisation features first. 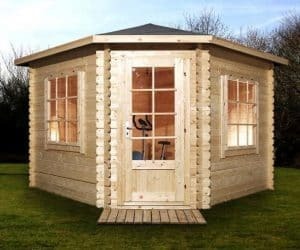 The main two things you need to decide is the thickness of the cladding and the type of glazing you want the cabin to have. Depending upon what you select, the cost difference can be pretty staggering. The initial cost of the building comes with 28mm cladding and single glazing. So if you’re happy with this you won’t need to pay any extra. Even if you choose to just upgrade to double glazing, the additional cost isn’t too high. However, if you decide you want to benefit from the thickest 44mm cladding and double glazing, you are looking at an additional £921. Now obviously this is a lot of money to spend, but what you need to think about is the extra durability, insulation and security you are getting for that price. Overall you can choose from 28mm, 34mm or 44mm cladding. Each of these can include either single or double glazing. You also have a number of options when it comes to the type of roof covering you want the cabin to have. You are provided with free heavy duty mineral felt. Now this actually supplies quite a strong barrier against the elements and it also has a long lasting design. 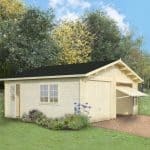 However, if you are looking at making the building as weather resistant and durable as possible, there are a couple of upgrades available. Firstly there’s the superior duty felt. Instead of mineral, this felt is created with fibreglass and is self-adhesive which makes it a breeze to install. It provides more protection than the mineral felt and isn’t very expensive. The other option you have, and by far the most protective, is shingles. Shingles have two main features. They offer a very decorative design, giving the building a more attractive, distinctive appearance. They also act just like the tiles you find on the roofs of houses. So you are guaranteed an outstanding level of weather-resistance. They are slightly on the expensive side but if you do want to maximise the durability of the cabin, they are a worthwhile investment. Both the shingles and the superior duty felt are available in charcoal and green colourations. As you will likely be using the cabin in the winter months, one extra you may want to consider is the Eco-Quilt insulation kits. There are two available, with one providing 30 square metres of insulation and the other offering 60 square metres. Both are made up of an impressive 6 layers of thermal wadding. There is also a reflective foil layer and breather foam included. This is a particularly good extra to invest in if you aren’t planning on upgrading to double glazing. Or even if you are opting for double glazing, it could dramatically increase the warmth of building in winter. The final extra available is likely to be outside of many people’s budgets. The solar panels aren’t an essential add-on, but if you are planning to install an electrical kit, they could act as a long term cost saving feature. Electrical packs give outdoor buildings a source of power, enabling you to use tools, machinery and appliances. However, they are notoriously expensive and they also require long term running costs. Then there’s the hassle of having them installed to worry about. The five different solar panels available from Waltons may be a lot more expensive than an electrical kit, but they require no running costs once they have been installed. You have a choice of roof mounted or freestanding panels, as well as different voltages. It’s important to pay attention to the different voltage options if you do decide to buy the solar panels. For example, the 12v, 100w kit is suitable for small appliances. The 240v. 200w panels on the other hand will provide a significant amount of energy into the cabin, ensuring you can use multiple outlets and power large appliances and machinery. There isn’t one thing we can fault with the quality of this cabin. It has an extremely luxurious design. The fact the tough timber cladding has been continued with the roof and the floor is a particularly great feature. If you’re looking for a cabin that will really last, this is definitely a good option. Due to the cladding thickness and the exceptional quality features, this building will last for many years. We like that despite the space-saving design, you actually receive a large amount of storage space. 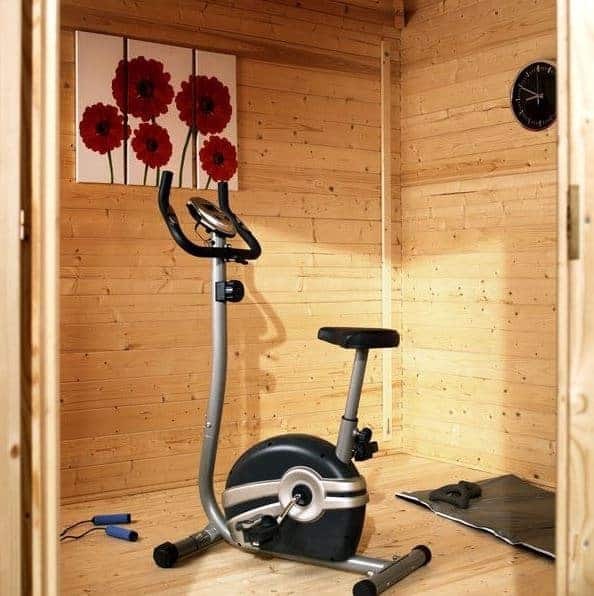 It’s easily capable of housing a small home gym, or you could turn it into a home office. The super-thick cladding also allows you to put up shelving if you want to. This is likely going to take you around a day to construct with 2 people. The only niggle we have is that we feel the directions aren’t overly clear for those who are new to the assembly of outdoor buildings. Although the initial cost may seem a little high, we feel this is actually really reasonably priced. After all, you are getting one of the toughest, most durable cabins available on the market. It boasts some incredible features and overall offers outstanding value. 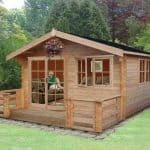 Final Thoughts: This is a chic, stylish log cabin that has been built with many fantastic features. Designed to really last, every part of its construction has been carried out to an exceptionally high quality. The mortice lock and key is a fantastic security feature, while the windows offer not only good levels of natural lighting, but also excellent ventilation. With an extra-strong floor and roof, you can rest assured the building benefits from fantastic support and you can store heavyweight equipment and furniture with ease. 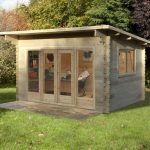 No matter whether you are using this as a home office, gym or a simple additional seating area, it is a sensational building that will look as good as new for many years to come.